Shaking off the shackles was just the first step for the starving teenager who escaped from the California horror house and saved her 12 siblings when she blew the whistle on her parents, experts said Friday. What prompted her to make a break for freedom on Sunday — and expose to the world what David Allen Turpin and Louise Anna Turpin had allegedly done to the family — is just one of the questions investigators in Riverside County are seeking to answer. Officials have not released the name of the teen who escaped and did not respond to questions from NBC News seeking more information about her. She had been planning her escape for two years, fled through a window and called 911 from a cellphone she had taken from the home, according to Riverside County District Attorney Mike Hestrin. Therapists who have worked with children who went through similar ordeals agree that the teenager had to overcome mental hurdles as well as physical ones like being chained to a bed. Bailey would know. Her past patients have included Jaycee Dugard, who was kidnapped on her way to a California bus stop at age 11 and held for 18 years before she was freed in 2009. “In my experience, with many children who were held captive, they were often looking for an opportunity to get away,” Bailey said. But many a time they are paralyzed by fear of retribution — and not just for themselves. Then there is “groupthink,” which happens in families and can short-circuit a potential escape if one member decides to make a run for it, Bailey said. All it takes is for one sibling hungry for parental approval — or extra food — to let slip that an escape is being planned. Also, Bailey said, it was probably no accident that the Turpins allegedly starved their children. Bailey said if there is a silver lining, it’s that the teenager got away and sounded the alarm. “We need to highlight her to show the world there is hope out there,” said Bailey. Dr. Bruce Perry, a senior fellow at the Child Trauma Academy in Houston, agreed. “The number of individuals who would immediately respond to an opportunity where they could get away is very small compared to the number of people who would have that paralysis and insecurity and confusion about what to do,” Perry told The Associated Press. 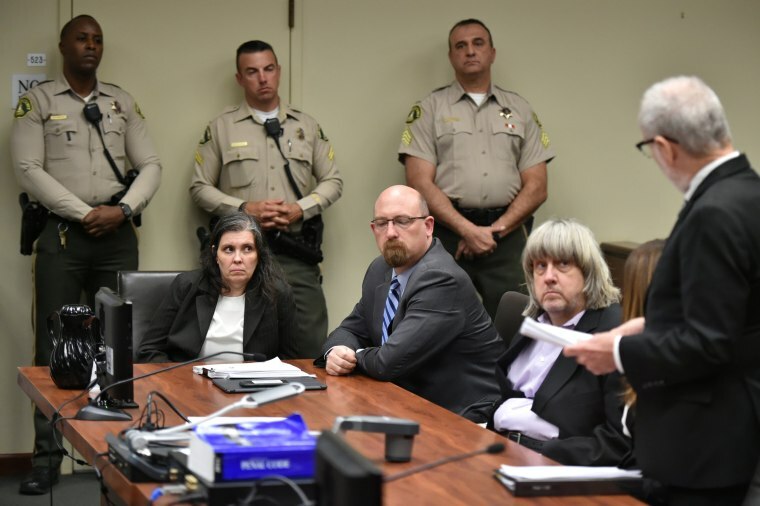 The Turpin children ate just once a day, were beaten, choked and chained to furniture and their beds with no access to a bathroom for months at a time, police said. The teen who managed to get out did so with her younger sister, who panicked and went back to the house. That, Perry said, makes the 17-year-old’s determination to get away all the more amazing. It’s also possible, Perry told the AP, that the Turpins got the older children to help them police the younger ones and make them complicit in the process. Combined with the physical and emotional weakness, it robs prisoners of the will to escape, he said. Mark Reinecke, who is chief of psychology at Northwestern Medicine and specializes in treating children, said "there are individual differences in how people respond to dangerous situations." The girl who escaped may have "better problem-solving skills." She may have gotten help from "supportive siblings." "What we can say with some certainty is that this was a very controlling family," Reinecke told NBC News. "This was done partly to prevent the world from seeing them. I think as the police investigation progresses, there's going to be a lot that we learn about this family and this girl."